Mike Sharp mobile air conditioning services is based in Llangynog, Carmarthenshire and is ideally situated to serve South and West Wales. Friendly, efficient, reliable mobile air conditioning, electrics modification and diagnostics company ready to meet the needs of its customers no matter if they are agricultural, commercial or private. That said, the majority of our work is agricultural air conditioning repair services across South and West Wales. We carry out air conditioning repair and service work for private customers, car dealerships, agricultural contractors, farmers, national and local plant hire and quarry companies, local authorities etc. We already carry out and continue to offer contracts to cover air conditioning repair and vehicle electric diagnostics. 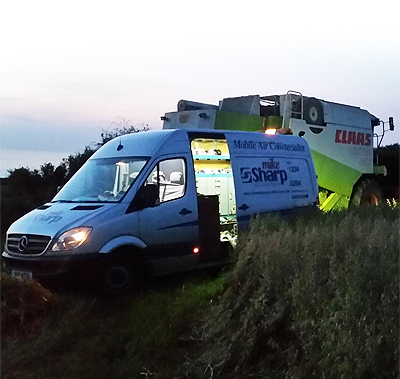 We carry out repairs to companies with fleet vehicles and agricultural machinery throughout West and South Wales. We don't have to be tied down to a yard or workshop, inverters mean we have a mobile power supply and are fully capable of carrying out repairs in any location. Auto Electrical Diagnostics & Repairs. Air Conditioning Servcing & Repairs. Webasto & Ebaspacher Auxilliary Heating Systems. Supply of parts from our extensive parts department.